Domain Name Service is our example of a directory service. It is the service which translates alphanumerical names into IP addresses. Here is a list of the top-level country domains. not recursive, in which case the resolver (the client-side DNS software which queries servers) must find out which server is authoritative and then ask it. Responses can be authoritative, coming from an authoritative server, or not, coming from a caching server. They can also be truncated, which means that not all of the information available from the server fits in the 512 byte limit. 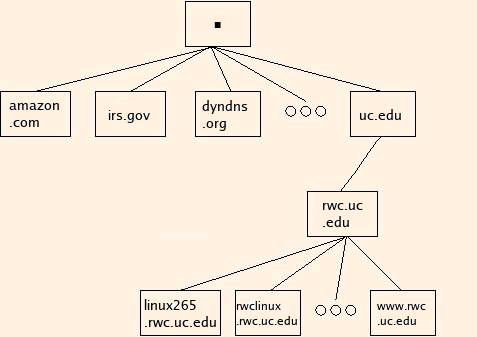 CNAME records, which provide "canonical names", or aliases. Responses also provide a time for which the data is to be trusted (the Time-To-Live). If a domain name does not exist, the response is NXDOMAIN: non-existant domain. caching, having no authority, but relaying DNS data from authoritative servers. Primary and secondary servers can also be caching servers for zones for which they are not authoritative. A lookup for anything less than an FQDN results in multiple queries until one (or none) is successful. The first query is for the name as requested. Each subsequent query is for that name followed by "search domains" (as specified in resolv.conf - see below), and finally by the local domain. Note that a search for "mickey.mouse." would only involve the first lookup. The use of search domains is discouraged, since it can result in excessive waits for DNS lookups. You can also perform this query using dig -x 129.137.122.97 (dig is a souped-up version of NSLOOKUP in Windows). DNS uses UDP port 53, except for zone transfers from a primary to a secondary server, in which case it uses TCP port 53.
named is the DNS daemon (Bind is the package, named is the program). named has been installed in a chroot jail located in /srv/named. The directories and files installed in /srv/named permit named to be run with /srv/named as its root directory; during operation, nothing in the filesystem above /srv/named is visible to the server software. This means that if named is compromised, the hacker has no access to any other directory or file on the system. Start named using /etc/rc.d/init.d/bind start. Examine the tail of the system log file using tail -n200 /var/log/sys.log. Test your server using dig @127.0.0.1 www.uc.edu. Examine the resource records. dig @server-ip -t AXFR domain can be used to test access through TCP after we reconfigure named. Modify your /etc/resolv.conf file to only use your name server. Modify your /etc/inittab file so that runlevel 4 is the default. This will cause named (as well as apache and samba) to be started each time you boot. The first mount allows you to access the partition containing the root partition at /mnt, without the links to /var. The second mount allows you to write to the root partition at /mnt (it does not affect the read-only mount at /). The sed changes the default runlevel from 3 to 4, and the final umount removes our access to the root partition through /mnt. ©2015, Kenneth R. Koehler. All Rights Reserved. This document may be freely reproduced provided that this copyright notice is included.